Whenever we make this lasagna, people rave about it. It all starts with the sauce, and UNCOOKED lasagna noodles (we prefer Barilla). Make sure you use enough sauce to completely cover the noodles. If you think you've used too much, its probably just right! Feel free to leave things out that you don't like & make substitutions. Bake, covered, at 375 F for 45-60 minutes (depending on the size of the lasagna), and uncovered for 10 minutes more. You want most of the moisture to have soaked into the noodles before you uncover it. If it still looks too bubbly around the edges, cook it longer. This recipe from Kraft magazine is a great way to use up old tortillas. The *ingredients are ones that I added/changed. 2. Brown ground beef & drain fat. Add onion and cook until tender. 3. Add salsa, beans, dressing, taco seasoning, cumin & garlic. 4. 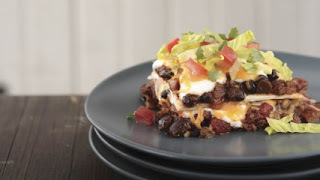 Arrange tortillas in a casserole dish, cover with meat mixture, sour cream & cheese. Repeat layers. 5. Bake for 30 minutes, covered. 10 minutes, uncovered. In a large mixing bowl wisk together egg yolks, vanilla, coconut oil, agave, milk and kefir until combined. In a small bowl combine dry ingredients and stir. Add dry ingredients into the wet mixture until just incorporated. In another bowl whip the egg whites until stiff peaks form. Fold whites into batter. Spoon desired amount into your waffle maker, cook and enjoy! *Feel free to add nuts, fruit or chocolate to the finished batter, or sprinkle on top. So I was combining/modifying a few different sloppy joe recipes that I have trying to find the perfect combo. I think that I was successful. Give it a try and let me know what you think. 1. Brown ground beef & drain fat. 2. Add onions & cook for 5 minutes. 3. Add garlic & cook for 1 minute. 4. Add the rest of the ingredients. Simmer for 5 minutes. Thanks Heidi for the invite. I have been learning a lot about cholesterol and how to lower it. This recipe is high in Omega 3s! Enjoy! *Blend all ingredients together in a blender or Magic Bullet until smooth. This recipe makes 5 3-4 inch pancakes. Feel free to fold nuts, fruit or chocolate chips into the batter. I cook mine with 1-2 tsp coconut oil. More Omega 3s!! 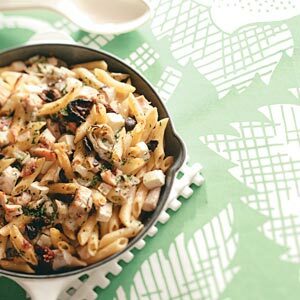 This recipe from Kraft Foods magazine. It would work great for feeding a crowd. LINE 15x10x1-inch pan with parchment paper, with ends extending over shortest sides of pan. Spray with cooking spray. BEAT eggs, milk and flour in large bowl with whisk until well blended. Stir in next 4 ingredients. Pour into prepared pan. Bake 14 to 16 min. or until edges are almost set. Top with cheese; bake 2 min. or until melted. 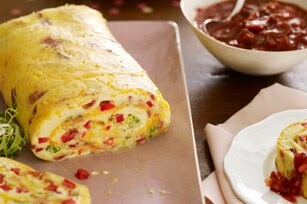 ROLL up omelet immediately, starting at one short end and peeling off paper as omelet is rolled. Place on platter; cut into slices. Serve with salsa.